New muscle gains depend on protein, so it’s wise to try and include this valuable muscle-building nutrient in every meal of your day, starting with the most important one: the breakfast. According to one amazing research published in the International Journal of Obesity, people who eat a protein-loaded breakfast tend to eat around 30% fewer calories at lunch than people who eat breakfast with less protein. Protein-rich meals will keep you full for longer and make sure your muscles have all the ammo they need to exert maximum force in the gym. Everyone’s needs are different, of course, but people who work out regularly should eat about one gram of protein per pound of body weight each day. And if you’re a dedicated lifter, you’re probably already struggling to get all the protein you need every day, especially if your schedule doesn’t leave you with much time to prepare elaborate meals in the morning. 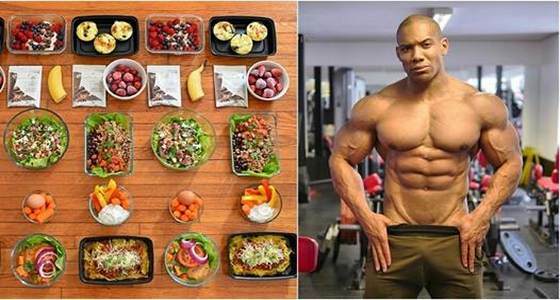 But before you reach for the vending machine for some popular and convenient “healthy” food that might be full of sugars and will leave you feeling hungry, try our 5 easy, fast and super-delicious high-protein breakfast ideas for bigger muscle gains! Eggs offer a great amount of high-quality protein, vitamins such as A, E, K and B, riboflavin, folic acid, minerals like calcium, zinc and iron… the list goes on! The muscle-building power of eggs is unmatched, as the yellow orbs contain all essential amino acids needed for optimal muscle recovery and muscle growth. And it’s also convenient as it gets! The most easily-portable variant is the boiled egg, of course, so we suggest you to prepare a power combo of 3 large eggs (with yolks!) and two slices of Ezekiel bread with your favorite low-calorie jelly for a real morning energy punch! Together with Greek yogurt, cottage cheese is one of the most convenient and versatile high-protein foods that deserve their place on a bodybuilder’s breakfast menu, and it’s also a good source of calcium and vitamin A. Combine 1 cup of low-fat cottage cheese with no added sodium with slices of your favorite fiber-rich fruit such as peaches, apples, strawberries or even bananas. Adding a whopping 30 grams of protein to your morning meal has never been easier! Greek yogurt has become all the rage with healthy people who want to have their protein and enjoy it too! Compared to most other yogurt brands, Greek yogurt delivers the most protein, and there are countless ways to combine it with other muscle-friendly foods and prepare a tasty breakfast. Buy plain Greek yogurt to avoid added sugars, and combine one cup of it with ½ cup of oats and some vanilla extract, then let the mixture sit in the refrigerator overnight. In the morning, mix in a handful of fresh or frozen fiber-rich berries and 1 scoop of vanilla whey protein. Ta-da! As we mentioned before, eggs are loaded of muscle-building protein and healthy fats that help your organism function optimally, fuel your body and allow you to build lean muscle faster, and there are so many amazing ways to translate this muscle-building awesomeness into a tasty meal! If you’re looking for a low-carb breakfast recipe that will keep you full and lean, don’t overthink it – the basic veggie and egg scramble will give you all you need to stay healthy, satisfied and growing like a beast! Scramble 3 large eggs and add in ¼ cup of low-fat cheese and vegetables such as spinach, sliced tomatoes, peppers and mushrooms. Packed with complex carbs, oatmeal is probably one of the most popular breakfast meals in the world – being relatively neutral in taste, it can be a great base on which to play around with flavors and toppings, it’s easy to prepare and it’s chock full of fiber which supports weight loss! The best part of it all is that you can easily take your regular morning bowl of oatmeal to the next level by adding some protein and use it to build more lean muscle! Here’s how: combine ½ cup of quick oats with 1 tablespoon of peanut butter, 1 teaspoon of cinnamon and ½ cup of low-fat milk. Microwave it for one minute, then mix in one scoop of vanilla whey protein powder.